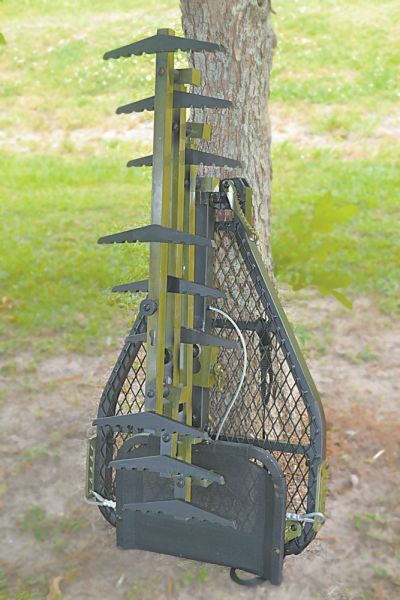 If you let bow season sneak up and you’re in the market for a brand new lock-on-style tree stand this year, check out these rugged, lightweight stands from Old Cypress Outdoors. They’re made in the USA, weigh just 12 pounds and feature an aluminum powder coat finish, an all-weather seat, a 20- by 28-inch platform and come with a block system for safe and easy hanging with two hefty 8-foot ratchet straps with safety pins. They’re made by hunters, so all the bases are covered for safety, adjustability and comfort: Each stand features a three-point seat adjustment, multiple adjustment combinations to fine-tune the level of the platform, and adjustable arms at the base of the ‘flat-back’ seat that hug the tree for superior side-to-side stability. And if you’ve ever struggled with your climbing sticks, Old Cypress employs a unique, silent interlocking system in which the sticks attach directly to the stand for easy backpack-style transport — no ratchet straps necessary. Old Cypress Outdoor stands sell for $189. Three 30-inch climbing sticks sell for $140, or you can get the Run-N-Gun package which includes three sticks and the stand for just $315. To buy a stand online or get more info, visit www.oldcypressoutdoors.com.